Our 2-day multipitch climbing course is for the single-pitch climber who would like to take their skills further on multipitch routes. By the end of the course, you will have the tools to lead climb multipitch routes all over the UK and abroad. Our multi-pitch climbing course will teach you the skills that you need to head onto the big routes in the high mountains safely and efficiently.We will also look at dealing with complicated descents, and look at the planning and decision making process. 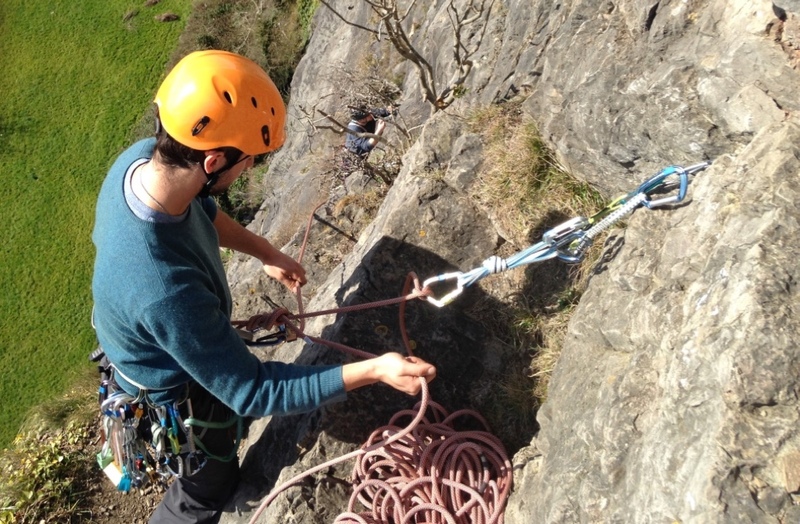 The multipitch climbing course is 2 days long, and is run in the Wye Valley or Forest of Dean (Gloucestershire, Monmouthshire), Avon Gorge (Bristol, Somerset), or North Wales. The client-to-instructor ratio does not exceed 2:1, to ensure that we can give you our fullest attention. Wye Valley (Gloucestershire), Avon Gorge (Bristol, Somerset) or North Wales. Our multipitch climbing course is suitable for anyone that has experience climbing single pitch rock climbs. If in doubt about whether the course is suitable for you, please don’t hesitate to contact us. Each day of our multipitch climbing course we would introduce the topic of weather, ability, and how this would affect venue selection, and route planning. You will learn everything you need to go multipitch climbing. This day tends to be packed with lots of information, and may sometimes feel overwhelming. We will look at equipment selection, a multipitch climbing rack (what is enough), route selection, guidebooks, climbing calls and communication. We will spend a substantial amount of time looking at the building of complex anchors (in and out-of-reach), and stance management. Here we get you to put all you have seen on the previous day into practice. We will also emphasise hanging belays, and most importantly descending safely. As climbing is only half the work. The course content and location tends to be dictated to us by the weather, so the multipitch climbing course layout can change. If you are unsure whether the multipitch climbing course is suitable for you, please do not hesitate to contact us on info@riseandsummit.co.ukor call us on 07775 853 348, and we would be happy to help.